Hello all! It's been a long time since I've posted but I wanted to get back into blogging occasionally. 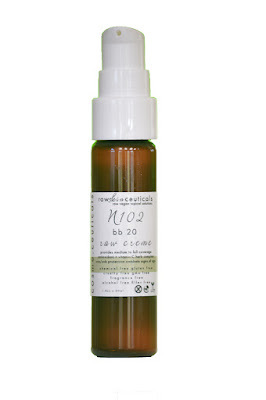 Today I have for you a review of a little known brand called RawSkin Ceuticals. RawSkin Ceuticals is a brand that mainly focuses on natural skin care as well as having a small selection of all natural cosmetics. The main reason I found the brand is because I am desperately looking for a new liquid foundation that would not only match my skin but won't break me out. This is ridiculously difficult however as I break-out due to silicones, and coconut oil (and variations of coconut oil), but I also want to stay cruelty-free. In addition to this I'm highly allergic to sunflower and sesame seeds so oils or waxes from either of these also excludes products. Most mainstream foundations have silicone in them, or if they don't they seem to use coconut oil as one of the main ingredients instead. (Any ingredient that ends with -cone in the name is a form of silicone, and Caprylic triglyceride is another name for refined coconut oil). RawSkin Ceuticals is one of the only brands I found that make a liquid foundation but also is cruelty-free, silicone-free, coconut-oil free and isn't crazy expensive. One thing I did notice to keep in mind is that RawSkin Ceuticals seems to have coupon codes often, and if you sign-up for their e-mail, which is free, you get a % off code. 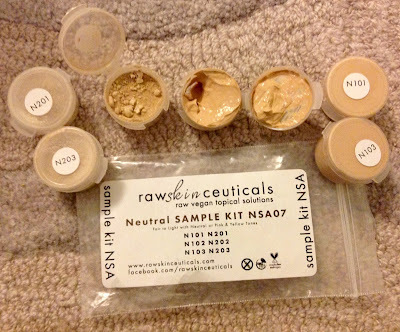 So around the holidays during a sale I purchased their neutral fair to light tones sample set. They have three ranges of colours, warm, neutral and cool as well as fourteen depths of tone, so forty-two shades. The set I purchased included their three lightest neutral toned foundations in both powder format and liquid format. I ended up being their second lightest shade N102 and N202 for their liquid and powder foundations respectively. This was nice as usually I'm the palest foundation shade in a range and I know there are paler people out there, so it's great that they have such an extensive selection. The only thing I don't like is that they include an spf rating, which I doubt they actually have as legally to have such a rating each shade of a product must be tested by the government in order for the company to claim as such. As a small company I doubt they could afford to do this expensive process. Instead I wish they had instead just put that the Titanium Dioxide and Zinc Oxide both provide a small level of sun protection. You'll notice that the powder foundation has a bunch of hydrating oils and butters in it, this is still a powder foundation, it's just the ratios of powder to liquid product when mixed is watched closely. It still is a powder product. 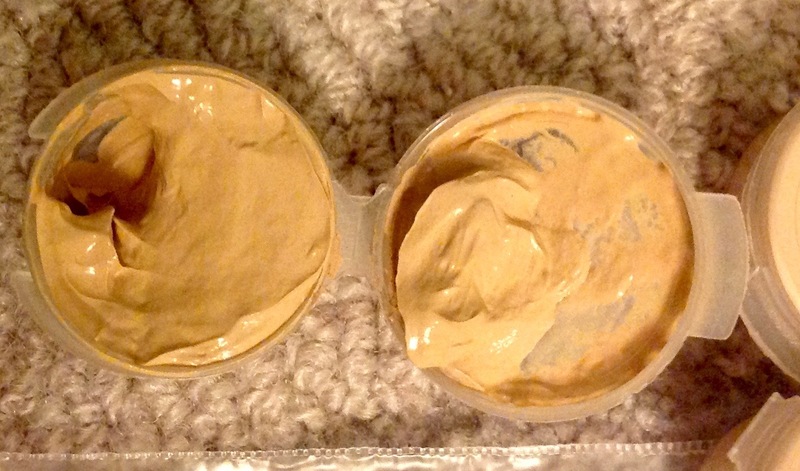 That said however, it is a very moisturizing powder foundation (more about that in a bit). For those of you out there with acne you're likely looking at the ingredients in horror with all the natural oils in these. Not all oils are the same. There are certain oils that will break you out and some that will not, all depending on the fatty-acid (building blocks of oils) make-up of the oil in question. An excellent site about this and the comedogenic properties of a ton of different oils can be read about here. Something to keep in mind is that the higher the percentage of linoleic acid in an oil the better it is generally for acne-prone skin. 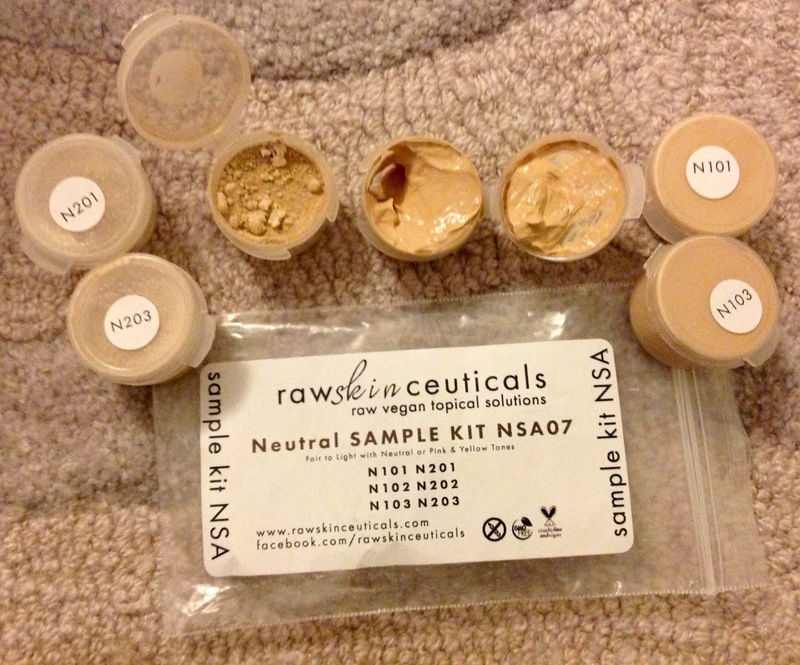 The sample set allows you to find your best shade and provides you with huge samples. Each clam-shell is packed full to the top and provides at least a full weeks worth of product. The liquid/cream foundation retails for $25 USD and the powder foundation for $20 USD. 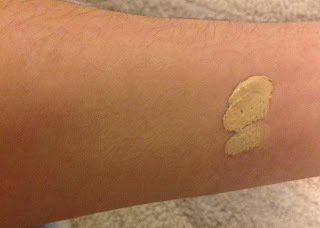 For the liquid/cream foundation I found it had a sort of in-between liquid and hard cream texture. It goes on well and covers fairly evenly with some blending. I would say it has medium to full coverage. It looks super nice when it's first put on but my combination oily skin tends to kill that in about an hour and a half. Then I just look oily, especially along my t-zone. This would be fabulous for a drier skin-type than myself but it's just too moisturizing for my skin. This foundation really does have a lot of oomph on the moisturizing front, as I found it didn't exasperate my dry sections at all. As for the powder foundation it goes on well. Like most powder foundations it needs to be buffed in. 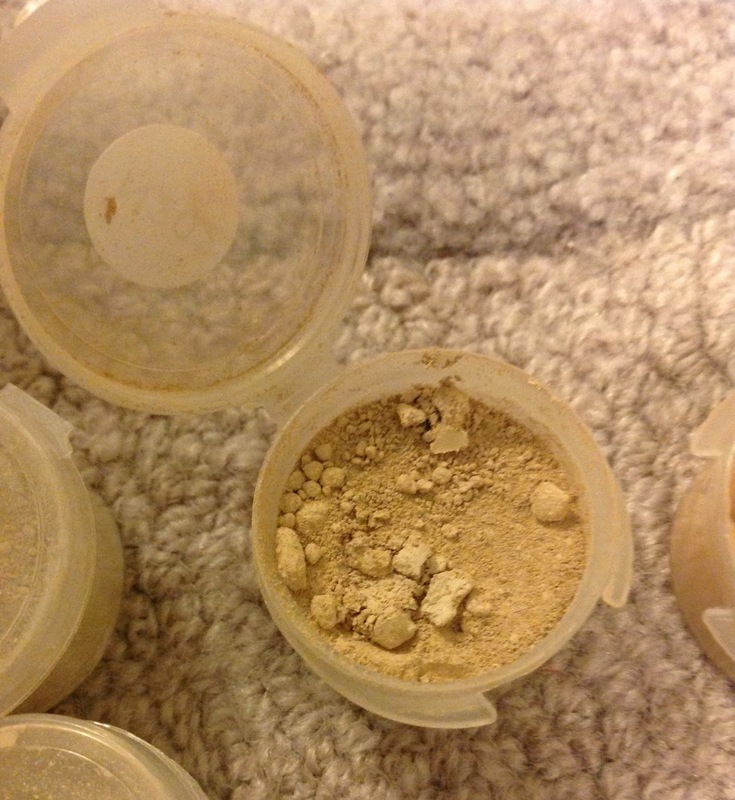 One thing to mention is that in the sample the powder can look sort-of balled up but it isn't a problem for application, I think it's just because of all the moisturizing ingredients that it includes in it makes it not as dry as some powders. It lasts longer on me than the liquid one but I still do get uncomfortably oily from it sooner than other powder foundations I've tried. That said it's also the most moisturizing powder foundation I've ever tried, in that it doesn't tend to make any dryness worse over the course of the day. It will, like all powder foundations, still cling to dry-spots when first applied though. One last thing to keep in mind is that due to their herbal blend both the liquid and the powder foundation have a slight sweet-herb scent to them. It's natural and doesn't bother me at all, but something to keep in mind if you are sensitive to scents. Overall, I wish I had less oil in my skin because I really like this foundation, it just unfortunately doesn't hold up against the oil my skin produces over the day. That said I haven't had any break-outs from my samples, and I'll likely use up my sample in both the liquid and the powder. The powder mainly just needs a touch up later in the day and the liquid will be fine if I'm going out at night just for a couple hours or so. I've also been using the liquid in the drier places on my face and covering the rest with a couple layers of another foundation I'm testing for a bit more coverage. If you have more normal to dry skin I recommend giving this a try. Disclaimer: I purchased this product myself.